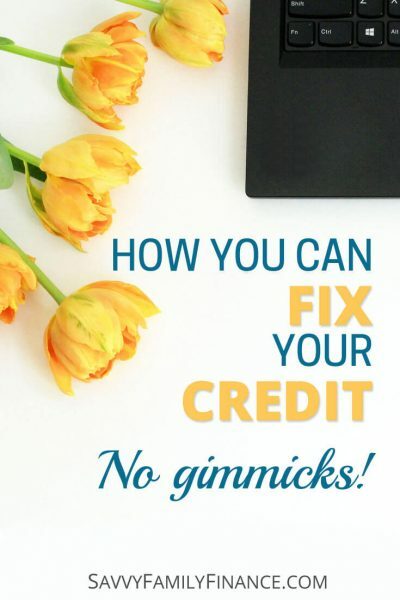 Inside: Learn how to rebuild or fix your credit score the right way. We can make some pretty stupid financial mistakes when we are young. Or maybe a series of unfortunate events led to your credit score going to pot. Whatever the case may be, it is possible to fix your credit. The process of repairing your credit is not an overnight process. But, the lower your score, the greater the potential for faster initial gains. In order to fix your credit score, you are first going to need to understand how the powers that be determine your score. A credit score is a number, usually ranging from 300-850, that lets a lender know how likely they are to get their money back. Your credit score is based on information in your credit reports at the credit reporting agencies. The three primary credit reporting agencies are Experian, TransUnion, and Equifax. A low score, such as one below 580, would indicate you are a high risk to lenders. You will likely either be turned down for credit or required to put down a deposit for many services. A score from 580-669 would put you in the medium-high risk category. This score would mean you will still find it difficult to obtain loans, credit cards, or will be subject to higher interest rates. A score of 740 or above means you are very likely to repay loans on time and are a good credit risk. Banks are more likely to lend you money and offer lower interest rates. A good credit score makes the money part of life easier. Potential employers may look at credit scores as part of their evaluation process. Mortgage and car loan approvals are dependent on good credit scores. Lower interest rates are available to people with a good credit score, so you pay less overall. A good credit score means lenders are willing to loan you more money. Potential landlords may check your credit score to verify whether you are likely to pay rent on time (or at all!). Because of the different reporting agencies and a few other factors thrown in, your score may vary a little bit based on the formula a lender chooses to use. However, we do know that basically, a score is made up of 5 components. Payment history = 35% One of the most important and largest contributors to your score is your payment history. The rating here considers whether you pay bills on time or not. Amounts you owe = 30% This portion of your score consists of how much you owe on your accounts, especially the amount of available credit being used. Length of credit history = 15% The length of time you have had accounts open and even how recently you have used an account makes up 15% of your score. Credit mix = 10% Your mix of installment accounts (such as loans) and revolving credit (credit cards) makes up the remainder of your credit score. 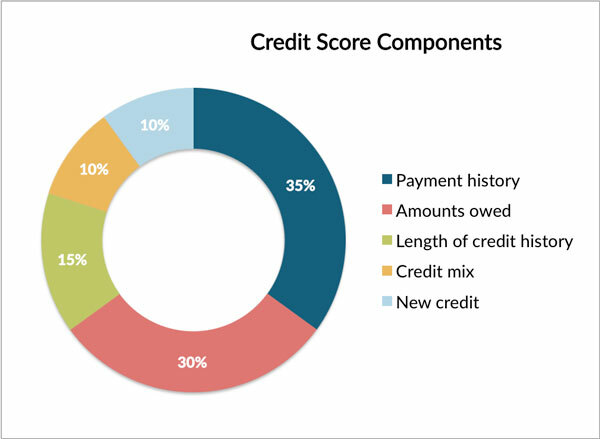 New credit = 10% This part of the score consists of credit inquiries and recently opened accounts. If you open or inquire about a lot of different accounts at once, that signals that you may be having money troubles. The very first step to take when you want to improve or fix your credit score is to figure out exactly where you stand and what got you there in the first place. This means you need to get a copy of your credit report from each of the three reporting agencies. Everyone is entitled to a free credit report each year from each agency. You can order them all at once, or spread them out so you order from a different agency every 4 months. The easiest way to get a free copy of your credit reports is by going to AnnualCreditReport.com. You will be asked for information to verify your identity, but when ordering the free reports, you will NOT be asked for payment information. Once you get a copy of your report, go through it and ensure everything on the report is correct. Check names, dates, addresses and dollar amounts. If you find a mistake, you can dispute the errors with the appropriate credit reporting agency (Equifax, TransUnion and Experian) online. There are services available to view your credit score online such as Credit Karma and Credit Sesame. However, I’ve found many banks and credit card companies now offer this service for free with their online access. Try logging into your bank or credit card account and see if they have an option for viewing your credit score for free. So, now what? If your score is 800+, or even 780+, you are in good shape. But, if you have a score lower than 780, there are improvements that can be made. Not surprisingly, the best way to fix your credit score is to optimize the different components of your credit score. Did your credit report indicate you are late on payments or that some accounts have gone to collections? If so, then you will need to work your way into good standing with these accounts. Call the lender and ask them to confirm in writing that, once the remaining balance has been paid, they will mark your account as “paid as agreed” or will erase the debt. Once you have the written confirmation, then pay off your delinquencies. Caveat: If you have a delinquent debt that you haven’t made a payment on in years and you cannot afford to pay, it may be in your best interest to hold off contact and consult with a consumer law attorney or legal aid. If you make a payment on a debt that is about to go beyond the statute of limitations, making a payment could reset the clock on collections. Your payment history makes up the largest portion of your credit score, so it is something you want to get right. Do whatever you need to pay your bills on time. You can automate your payments, or even set a reminder in your calendar a week before the due date and pay the bill a few days early. What happens if a payment is late? Late payments stay on your credit report for seven years, with more recent late payments impacting your score the most. If you skip or miss a payment, that can do even more damage to your credit score. If you want to fix your credit, you need to pay your bills on time, all of the time. Your credit utilization, or the amount of available credit you use, is another large part of your credit score. For a good credit rating, you want to keep your overall credit use to less than 30% of your available credit. So, if you have a credit card with a $10,000 limit, you want to keep the balance under $3,000. People with the best credit scores keep utilization under 10%. If you are planning a large purchase, it may even be worthwhile to prepay your account to keep the balance low. If you have been making on-time payments, but are having trouble keeping the available credit you use under 30%, let alone 10%, then it is time to ask for an increase in your credit limit. You may even find that correcting your credit utilization is what is needed to improve or fix your credit. You will only want to ask about increasing your credit limits if your payment history is good and you are currently employed. Once you do, it is a great way to adjust the math in your favor. Using a credit card responsibly is an excellent way to build your credit. One great way to do this is to use your card to pay a small, recurring monthly bill and then paying the credit card balance off completely each month. You could easily set this up with a Netflix subscription or maybe one of your utilities. If you haven’t made loan payments in the last few years, this is another way to build your credit. It is understandable if you don’t want or need to take out a car loan or mortgage. What may work is to take out a small credit-builder loan. These are offered by some credit unions and community banks. They are essentially small personal loans where the bank deposits the loan amount (often $100 – $1000) to an inaccessible savings account. Once you’ve repaid the loan, you get access to the money. As it is, the overall utilization rate is under 30%. However, if you were to pay off credit card 4 and close credit card accounts 4 and 5, then the utilization rate is now well over 30%. And if either of those were older credit cards, you’ll be hurting your score by closing accounts that give more weight to the length of your credit history. Before you close any accounts, check what your new utilization ratio will be so you don’t end up hurting your credit score. However, if having cards open will drive you deeper into debt or the cards have high annual fees, then it may be better to close the accounts. This component of your credit score takes into account recently opened lines of credit and recent inquiries. If you open several new accounts or even apply for several different lines of credit in a short time span, it can negatively affect your credit. That’s it. If you follow those basic rules, you can establish good, or even an excellent credit rating. There are no secret formulas or 30-day gimmicks involved. Have you tried to fix your credit score?